FUNAI is responsible for mapping out and protecting lands traditionally inhabited and used by these communities. 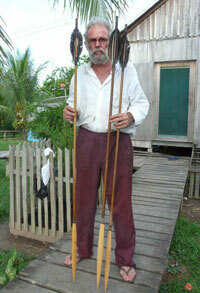 It is charged with preventing invasions of indigenous territories by outsiders. All over Brazil, indigenous peoples are living in differing degrees of isolation. Illegal miners, ranchers, loggers and other groups pose a risk to Indians’ lives and well-being and destroy their natural resources. FUNAI’s task is to ensure that their rights are respected as set out in the Brazilian Constitution and the Indian Statute. Its work is wide-ranging and includes opposition to ‘Hakani’, the controversial evangelical missionary film which promotes intervention by the authorities in tribal communities. FUNAI is made up of several departments, one of which is the General Coordination Unit of Uncontacted Indians (CGII), established in 1987. It is the only government department in the world which is dedicated to the protection of indigenous peoples who have little or no contact with national society and other tribes. The department was founded by Sydney Possuelo, as a result of witnessing death and disease provoked by government missions which sought to make contact with previously isolated tribes. at a jungle outpost in Acre.He introduced significant changes to government policy, and the previous strategy of establishing contact with such groups with the aim of eventual integration was substituted for one of protection and respect for the Indians' right to remain isolated. Nowadays, contact is only sought if isolated groups are thought to be under serious threat. This Uncontacted Indians unit is responsible for protecting 14 million hectares of isolated Indians’ territory, more than three times the size of Switzerland. 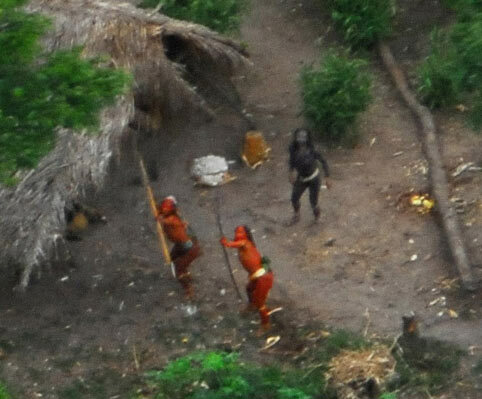 In 2011, it released photographs of an uncontacted tribe taken from the air. The images received major international media coverage. Before FUNAI came into existence, its role was entrusted to the Indian Protection Service (SPI) founded in 1910. FUNAI's official logo.It aimed to protect Indians by bringing them into ‘mainstream’ national society, thereby eliminating cultural diversity and freeing up their lands. Nevertheless, the creation of this body introduced a significant change, removing the church’s monopoly in ‘assisting’ indigenous peoples. Under its founder Marshall Cândido Rondon, the SPI started with high ideals, but it later suffered from bureaucracy and controversy as corrupt officials went unchecked and it failed to provide medical care and protection to newly contacted tribes. This neglect worsened into a terrible litany of persecution and exploitation on the part of SPI officials. In 1967 the true extent of criminal actions against the indigenous population of Brazil was exposed in the Figueiredo report, commissioned by the Ministry of the Interior. The document, over 7,000 pages long, revealed a catalogue of atrocities from mass murder and torture to slavery, sexual abuse and land theft. It held the SPI responsible for much of the suffering and even for the extermination of some tribes, the very people it was supposed to protect. It concluded that 80 tribes had disappeared completely. There was public outcry in Brazil and concern around the world. Sunday Times.A British newspaper, the Sunday Times, sent writer Norman Lewis to investigate. His article, 'Genocide', shocked the public and led to the founding of Survival International in 1969. As a result of the Figueiredo report, the SPI was replaced by FUNAI in 1967.